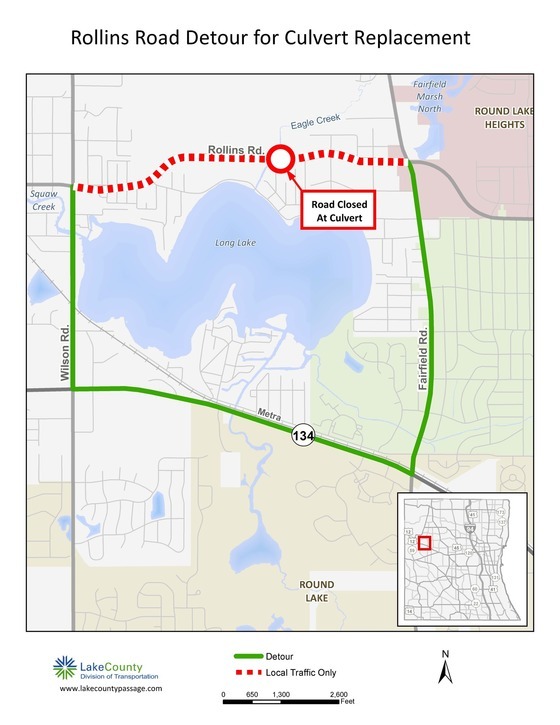 Lake County, IL - The Lake County Division of Transportation (LCDOT) will be closing Rollins Road, from Fairfield Road to Wilson Road to through traffic starting Monday, Oct. 15 at 6 a.m. and will reopen by late afternoon on Monday, Oct. 29. The closure is necessary to replace the Eagle Creek culvert. Detour Route: Fairfield Road to IL 134 to Wilson Road. Local traffic will have access on Rollins Road from Elm Avenue west to Wilson Road and from Grove Avenue east to Fairfield Road.